Catholic schools may better inculcate values of self-control in young children, a new study from the Thomas B. Fordham Institute suggests. The study found that elementary-level Catholic-school students generally outperformed their peers when it came to self-control and acting out, indicating that Catholic schools' emphasis on "teaching the whole child" may be useful in encouraging students to self-discipline. Disciplinary practices have become a point of contention in recent years. Many within the Obama Administration were concerned that disadvantaged students, especially those who are black or Latino, were being unfairly targeted for discipline in the public-school system. The DOE issued a "Dear Colleague" letter in 2014 that indicated it would interpret a racially disparate impact of disciplinary action as discriminatory, even if there was no evidence of discriminatory intent. Subsequent analysis has cast doubt on the efficacy of this intervention. The Fordham report suggests that educators may be able to sidestep this suspension debate entirely through an emphasis on self-discipline. "One thing seems certain," the report notes: "Self-discipline is far better than the externally imposed kind." The study compares students from two waves of a nationally representative cohort study that tracked Catholic, non-Catholic private-school, and public-school students through grade 8. Teachers were surveyed about their students' progress in that time period, which is how the study's authors were able to identify the key variables of interest. These variables were measures of "externalizing behaviors"—namely how frequently a child argued, fought, got angry, acted impulsively, and disturbed ongoing activities—and measures of "self-control," such as a student's temper, respect of others' property, acceptance of peers' ideas, and handling of peer pressure. The study's authors compared Catholic-school and non-Catholic-school students by these heuristics over their K-to-5 careers, controlling for a host of factors including gender, race, and English-language-learner status. What they found was that Catholic-school students tended to outperform their public and non-parochial private-school peers on both measures. Catholic-school students in both waves by and large did better than their private and public-school peers on not acting out—notably, the effect was larger for Catholic schools compared against private schools than compared against public schools. The same was true for measures of self-control, with Catholic-school students outperforming their private and public-school peers through their early years. The exception came in the second wave of the study, where Catholic students underperformed public school students on self-control measures. Notably, the positive effects of Catholic schooling on discipline were apparent across gender, race, socioeconomic status, and immigrant status categories. 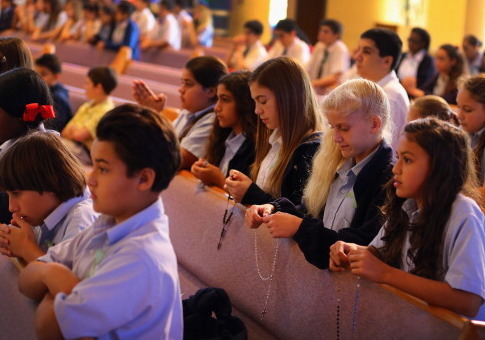 "Students in Catholic schools, regardless of their personal characteristics or backgrounds, exhibit more self-discipline than students in other private or public schools," the report noted. The study's authors conceded that they could not necessarily show a causative relationship, because it was possible that the sort of child less likely to act out or fail at self-control was also the sort of child likely to attend a Catholic elementary school. However, if there is such a "Catholic schools effect," it is likely connected to the religious and moral focus that Catholic institutions tend to impart to their curricula. This the report ties to these schools' profession of "Judeo-Christian values [like] humility, obedience, kindness, tolerance, self-sacrifice, and perseverance." However, the report is quick to add that public and secular-private schools looking to imitate their Catholic-school colleagues do not necessarily need to adopt religious mores. "That doesn't mean that such secular approaches—and schools—don't have their place. Of course they do. And so do character education, ethics classes, and civics, all of which can contribute to the development of self-discipline," the report's foreword notes. "School leaders should choose the options that best suit their kids and culture." This entry was posted in Issues and tagged Department of Education, Education, Schools. Bookmark the permalink.